Sinn Féin President Gerry Adams says the party has made its final representations on the governments' text. Addressing a Sinn Féin selection convention in Navan, County Meath, on Wednesday night after returning from a meeting with Tony Blair in London, Adams dealt with the current situation in the political negotiations. "We look to both governments to make sure that the text is in line with their own stated position, that it upholds the fundamentals of the Good Friday Agreement," said Adams. "The DUP leader, Ian Paisley, also needs to face up to his responsibilities to join in the collective challenge of peace making." Adams added: "At this point in the negotiations, one of the most important issues to be resolved is the DUP's refusal to do this. This unwillingness to share power with Sinn Féin, to accept Sinn Féin's democratic mandate, and to respect the rights and entitlements of our electorate is a block on efforts to move forward. The DUP have not only refused to declare their willingness to accept the power-sharing core of the Good Friday Agreement, but their refusal to share power in Ballymena, Lisburn, Castlereagh and other local councils is the most practical evidence of their position. "The DUP demands are not acceptable to Sinn Féin. They should not be acceptable to the two governments. "Sinn Féin is determined to defend the Agreement and to ensure that any deal is entrenched in the principles of powersharing, inclusivity and equality, and the all-Ireland institutions which are the bedrock of the Good Friday Agreement. Ian Paisley says he wants a fair deal. So do we. The Good Friday Agreement is that fair deal. "Ian Paisley set out concerns about the issue of IRA weapons. Sinn Féin believes that this matter can be dealt with to the satisfaction of all reasonable people in the context of a comprehensive agreement. This can only be done under the tutelage of the IICD. Adams concluded: "In my view all outstanding matters can be resolved if the governments are genuinely committed to the Good Friday Agreement. A deal is still possible. But an accommodation — a partnership of equals — cannot be built through a process of humiliation. Our focus is on achieving a deal. In every negotiation there is a time when you have to call it. 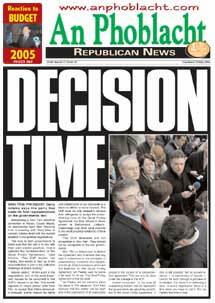 For Ian Paisley that time is now." We are at a defining point in the Peace Process. The last months, weeks and days have seen accelerating discussions, involving the DUP for the first time, about a comprehensive agreement which would see all outstanding matters dealt with and the Good Friday Agreement implemented in full. The discussion of the issues has been detailed, thorough and exhaustive. In my opinion these discussions can go no further — it is now time for a decision. The two governments are absolutely clear about Sinn Féin's view of their draft outline of a comprehensive agreement. Our party made our initial response when we received the document from the Taoiseach on 17 November. We gave our response in writing to them the next day. The criteria for our judgement on this document were also made clear. That is, that the proposals need to be bedded in the Good Friday Agreement and capable of delivering the Agreement in full. Sinn Féin's approach in this phase of the process has been twofold. We are trying to get the DUP on board. We are also seeking to ensure that any proposals from the governments, and any agreement emerging out of these discussions, are rooted firmly in the Good Friday Agreement. 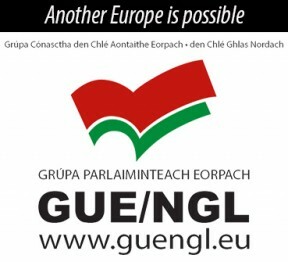 The governments' proposals have to be about delivery of the Agreement. They have to defend the democratic wishes and mandate of the electorate, north and south. Under the provisions of the Agreement, parties have to vote for the nominees for the joint office of the First and Deputy First Ministers. At this point in the negotiations one of the most important issues to be resolved is the DUP's refusal to do this. This unwillingness to share power with Sinn Féin, to accept Sinn Féin's democratic mandate, and to respect the rights and entitlements of our electorate is a block on efforts to move forward. Sinn Féin is determined to defend the Agreement and to ensure that any deal is entrenched in the principles of power sharing, inclusivity and equality, and the all-Ireland institutions which are the bedrock of the Good Friday Agreement. Ian Paisley says he wants a fair deal. So do we. The Good Friday Agreement is that fair deal. Mr Paisley's recent remarks, including his desire to 'humiliate' republicans, to have republicans 'wear sackcloth and ashes', and his party's constant use of offensive language, particularly in describing republicans as criminals and gangsters, is not the language of peace making. Republicans can find a lot to object to about being in government with the DUP. Both our party and Ian Paisley's have a lot to do to make this process a success. But the prize of a just and lasting peace demands that of all responsible political leaders. In this spirit it is worth remembering that the least said, the soonest mended. I rehearse all of this not as an obstacle to finding an agreement with the DUP — nor as a rebuttal to his remarks against republicans — but to remind everyone of the journey which the DUP has to make, in a very short time, if we are to achieve a comprehensive agreement and I do so also because I am looking for continued support from republican Ireland for Sinn Féin's efforts to secure this. Going into government with the DUP will be a huge challenge for republicans. Republican patience with how unionism deals with the political institutions, and with key issues like equality and human rights, will be tested because, obviously, there will be a battle a day on these matters. So let's face up to all of this with our eyes wide open. But this phase of these discussions has to be brought to a conclusion. If the DUP is not up for a deal then the two governments have to come forward with proposals to move the process forward. If the DUP refuses to engage properly, then the two governments must move ahead without them. The process of change cannot be frozen because rejectionist unionism refuses to come to terms with the new political realities. Political unionism cannot be allowed to veto the fundamental rights of citizens or to veto other changes necessary for the development of a peaceful society. All of these outstanding matters can be resolved if the governments are genuinely committed to the Good Friday Agreement. A deal is still possible. But an accommodation — a partnership of equals — cannot be built through a process of humiliation. Our focus is on achieving a deal. In every negotiation there is a time when you have to call it. For Ian Paisley, that time is now.